(Nanowerk News) As researchers around the world hasten to employ nanotechnology to improve production methods for applications that range from manufacturing materials to creating new pharmaceutical drugs, a separate but equally compelling challenge exists. Linsey Marr and Peter Vikesland, faculty members in the Via Department of Civil and Environmental Engineering at Virginia Tech, are part of the national Center for the Environmental Implications of NanoTechnology (CEINT), funded by the National Science Foundation (NSF) in 2008. Along with Michael Hochella, University Distinguished Professor of Geosciences, they represent Virginia Tech’s efforts in a nine-member consortium awarded $14 million over five years, starting in 2008. Virginia Tech’s portion is $1.75 million. Peter Vikesland and Linsey Marr, both associate professors of civil and environmental engineering at Virginia Tech, are members of the national Center for the Environmental Implications of NanoTechnology (CEINT) at Virginia Tech. They are exploring the impact of nanotechnology research on the environment. CEINT is dedicated to elucidating the relationship between a vast array of nanomaterials — from natural, to manufactured, to those produced incidentally by human activities — and their potential environmental exposure, biological effects, and ecological consequences. It will focus on the fate and transport of natural and manufactured nanomaterials in ecosystems. Headquartered at Duke University, CEINT is collaboration between Duke, Carnegie Mellon University, Howard University, and Virginia Tech as the core members, as well as investigators from the University of Kentucky and Stanford University. CEINT academic collaborations in the U.S. also include on-going activities coordinated with faculty at Clemson, North Carolina State, UCLA, and Purdue universities. 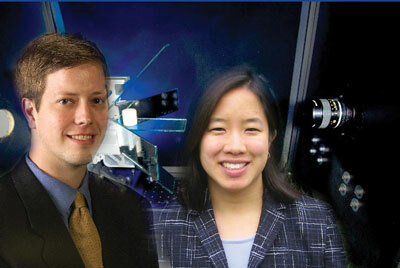 At Virginia Tech, CEINT is part of the University’s Institute for Critical Technology and Applied Science (ICTAS). In one of the novel ways Marr is conducting her tests, she and her colleagues are growing human lung cells and placing them in chambers that leave the lung cell surface exposed to air. This placement allows for direct contact of the cells with aerosolized particles at the air-liquid interface (ALI). One of Marr’s post-doctoral researchers, Amara Holder, and colleagues from Berkeley have previously exposed the cells to particles in diesel exhaust and a methane flame. They compared the ALI exposure to conventional in vitro exposure, where particles are suspended in a liquid cell culture medium. “With this design, lung cells can be exposed to substantial numbers of aerosolized engineered nanoparticles, such as silver and metal oxides, as single particles rather than large agglomerates,” Marr explained. A challenge in tests of nanoparticles’ toxicity has been that very small particles like to form aggregates, so testing interactions of the smallest particles with cells requires special approaches. “Airborne carbonaceous nanomaterials are likely to be found in production facilities and in ambient air and may exhibit toxic effects if inhaled,” Marr and Tiwari said. They further theorized that when exposed to the air, nanomaterials are likely to be chemically transformed after the exposure to oxidants in the atmosphere. In their preliminary studies, results indicate that “oxidation does impact solubility, as absorbance after resuspending in water is lower for fullerenes exposed to ozone.” The implication is that reactions in the atmosphere can transform nanoparticles and make them more likely to dissolve in water once they deposit back to earth. There, they can travel farther and come in contact with more organisms than if they were stuck to soil. To collect airborne nanoparticles for analysis, Marr’s group designed a low-cost thermophoretic precipitator that uses ice water as a cooling source and a 10-W resistor as the heating source. They flowed synthetic aerosols through the precipitator and used a transmission electron microscope to inspect the particles. “Preliminary analysis confirmed that this precipitator was effective in collecting nanoparticles of a wide range of sizes and will be effective in future studies of airborne nanoparticles,” Marr said. “The increasing production and application of the C60 fullerene due to its distinctive properties will inevitably lead to its release into the environment,” Marr’s colleague, Vikesland, said. Already, the biomedical, optoelectronics, sensors and cosmetics industries are among the users of the C60 fullerene. However, one of the components of natural water is natural organic matter (NOM). When the C60 fullerene is released in water, it forms “highly stable dispersed colloidal C60 aggregates or nC60,” Vikesland explained. These aggregates can exhibit significant disparities in aggregate structure, size, morphology, and surface charge and behave very differently than the C60 alone. So, Vikesland is looking at small molecular weight carboxylic acids such as acetic acid, tartaric acid, and citric acid, all widely detected constituents of natural water and biological fluids. He and his graduate student Xiaojun Chang have specifically looked at the formation of nC60 in acetic acid (vinegar) solutions, subjected the aggregates to extended mixing, and found that the solution’s chemistry differs substantially from nC60 mixed in water alone. “The citrate affects the formation of the nC60 in two ways,” Vikesland said. It alters the pH, a key factor in controlling the surface charge of nC60 and it directly interacts with the C60 surface. “These results suggest that the ultimate fate of C60 in aqueous environments is likely to be significantly affected by the quantities and types of carboxylic acids present in natural systems and by the solution pH,” Vikesland added. Furthermore, because carboxylic acids are common in biological fluids, Vikesland is interested in how his findings relate to the mechanisms by which C60 interact with cells in vivo.